Starting to learn any instrument can be very challenging. You are going head first into a whole new world which exposes you to what can be an overwhelming amount of information. Same goes for violins. This classical instrument is still one of the favorites with thousands of people starting out each year. However, with violins there is another added trouble - choosing that first instrument. We have all heard stories of invaluable violins made by old masters. Prices of these instruments can often be described as small fortunes. Because of that, there is a misconception that every violin has to be expensive. Today we are going to show you that is not the case. We will do so by going over some of the best beginner violins on the market and discussing what makes them worthy of that title. Before we do so, we will spend some time talking about what makes a good violin and what to look for when you shop for one. Without further ado, lets get into it! 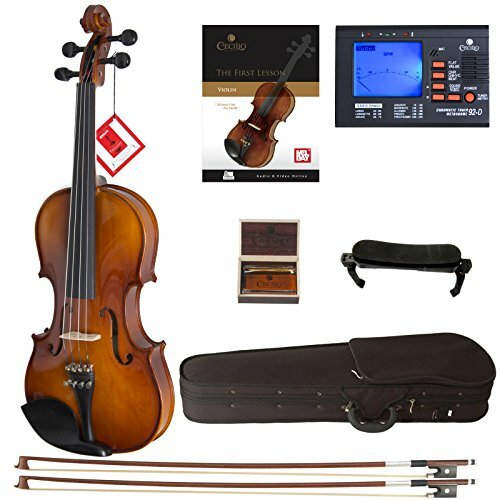 Are Beginner Violins Worth It? The short answer is an absolute yes! Violins, although fairly complex instruments, can be made to deliver a satisfying quality of tone without being too expensive. A student or beginner violin is the perfect tool for one to start learning how to play. If you think about it, this is the period when the new player is getting familiar with the instrument. That includes learning the what you can and can not do with a violin, how to treat it properly and so on. Some of these lessons are learned the hard way, which is something you don't want to do with an expensive violin. With all that said, not all beginner violins are made equal. It is important to know which features to look for and which to stay away from. In this segment of the guide we will try to arm you with the necessary information so that you can navigate the market with ease. Lets start with the most important factor to pay attention to - violin size. Violin size is perhaps one of the most overlooked factors when choosing a beginner violin. This is especially the case with kids whose parents go shopping for violins blindly. You have to find a violin that fits you. It is simple as that. That old 'they will grow into it' attitude is about as harmful as it gets. Fortunately for us there are 8 different violin sizes available, making it very easy to find the one that fits you. Adults and kids older than 11 or 12 are usually fine with full sized violins, however it is important to take that additional time and find the size that really fits. The main reason why we are so adamant about this is comfort. Comfort is very important when playing any instrument, but especially violins. You need to be able to grip the instrument properly, hold it up for a longer period of time without experiencing fatigue and so on. With all that said, the next step is to look at the build quality. Use the chart below for finding the right size. Higher end violins are usually hand crafted instruments. This means that some one sat down and invested a lot of time and effort into making them good enough for professional violinists. As you can probably imagine, beginner violins are held to a different set of standards. First of all, they are mass produced using processes which are not as sophisticated nor refined compared to hand crafting. Because of that, it is important to pay attention to the materials used to make the violin, how it was put together and overall fit and finish. Just like other acoustic instruments, violins rely on tonewood for the majority of their performance. The type of wood used will define what kind of sound you can get from a violin, how well it will play and how easy it is to master. This is where some brands might try and cut corners. Overall, you are looking for solid wood if possible, although laminates are known to work good as well. When it comes to the type of wood, you have maple, spruce and similar tonewood. These will give you the optimal bang for the buck in terms of sound. Having good materials in your violin isn't enough to make it a good instrument. In order for that to happen, said violin has to be put together properly. What we mean by this is good fitment, especially on important components. For example, if the neck joint isn't rock solid or if the hardware isn't sitting firmly, chances are that you won't get much out of that violin. Fortunately for us, most manufacturers who have established their presence in the beginner segment of the market are meeting the necessary standards of quality. Last but not the least we need to address fit and finish. We have already talked about the importance of well made joints, which also falls into the category of fit and finish. However, there is more to this. Violins need to be made of good materials but they also need to be symmetrical. Symmetry is going to be a byproduct of a proper crafting process. There is one universal truth about mass production acoustic instruments. You are never guaranteed a good setup and intonation. We see this every day with acoustic guitars, but also violins. This effect is noticeable especially with affordable models. Because of that, one of the best things you can do to ensure that your new violin will sound good is to take it to a shop for a proper tuneup. Technicians tasked with this job will be able to recognize any serious issues and fix them immediately. With that said, we aren't saying that every beginner's violin is going to require professional setup. What we are saying is that going through this process will squeeze the most out of your new instrument. When you have finally decided on a model, you have taken the first but not the only step. A violin on its own won't do you much good if you don't have the right strings on it as well as the right bow. Truth of the matter is that your selection of bow and strings can have a serious impact on how good your instrument performs. There are numerous types of both bows and strings to choose from, which can become overwhelming for someone who is just getting started. Because of that, we will give you few tips that might help you find the right accessories. Strings come in a whole variety of types. You will often see steel core strings being used by beginners. Steel core strings are affordable, fairly playable and allow you to really master the technique on the cheap. The only problem is they limit your range of expression. If you go and invest in a slightly more expensive set of synthetic core strings, you will get a much warmer and detailed sound. Similar goes for bows. Saving money on bows is not a good idea. If you think about it, bows are pretty delicate as it is. When you go and get a cheap one, chances are it won't last you too long before falling apart. Depending on the quality of a bow, it can be harder or easier for a beginner to play. Carbon fiber bows are usually the way to go for beginners. You are looking at a light, agile and durable piece that will last you much longer than cheaper bows, all while allowing you to get a good feel for the instrument. Weight and balance: the bow should feel like a natural extension of your arm. Look for something around the 60 gram range as this is the most common weight for beginners. Sound of different bows: each bow will produce a different quality of sound depending on the materials used. It can be difficult to discern this difference when you are just starting out, but as your ears refine you can start upgrading your bows. Now that we have covered the most important factors you should consider when choosing a violin, lets get to our top picks. We went ahead and did most of the legwork in an effort to show you what we think are the best models on the market. If you are just starting out and you aren't sure which violin to go with, any one of these will work just fine. Let's get to it. If you are looking for something a little more modern you can check out my review of the top electric violins. 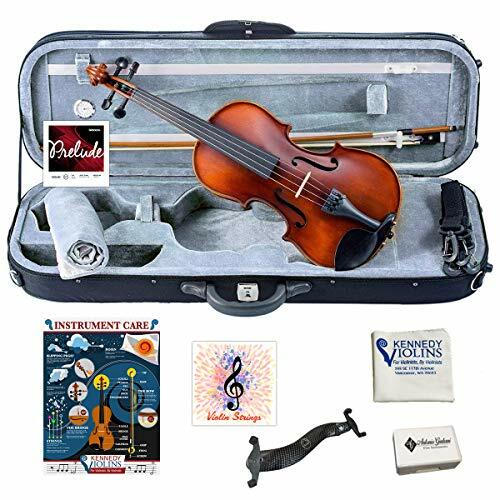 Electric violins are great for young players who would have fun playing through an amp and changing the sounds of their instrument. One of the best deals on the market right now is Mendini MV300. Mendini is a brand that belongs to Cecilio, which is a well known powerhouse in the industry. The violin is made of solid wood, featuring a spruce top as well as maple back and sides. 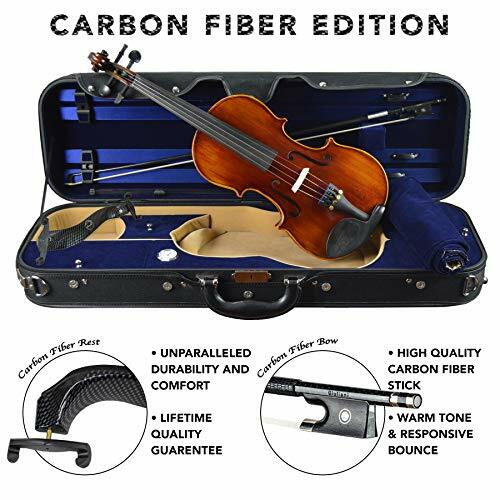 Since this is a kit, you get much more than just a violin. The bestseller on today's market. Mendini has included a Brazil wood bow, a case, extra set of strings and more. Overall, you are looking at a well made, affordable and great sounding instrument that will get you the performance you need. Bottom Line: Mendini MV300 starter kit is a great way to get a new player started right away. 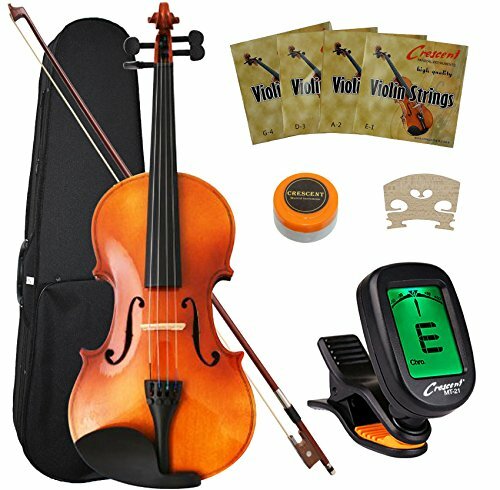 Next comes another awesome violin kit, this time from Crescent. It is a full sized model that features spruce top paired with maple back and sides. In terms of build quality, this violin is definitely decent. Considering how affordable it is, you can count on it delivering a satisfactory performance. The kit includes your standard accessories. We are talking a soft case, a tuner, rosin, a set of backup strings and a backup bridge. 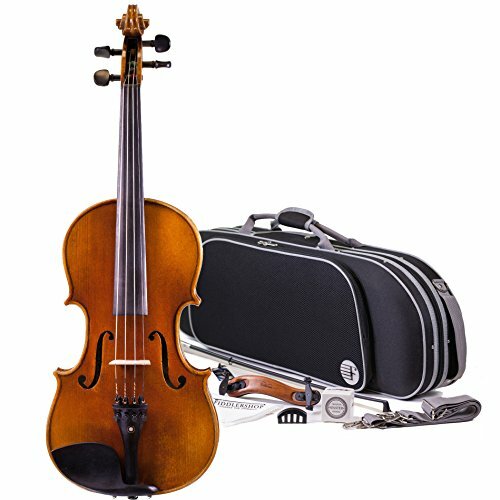 If you are running on a very tight budget, Crescent 4/4 violin could be one of the best choices for you. After covering the most affordable models on the market, it's time to check out some more serious violins. 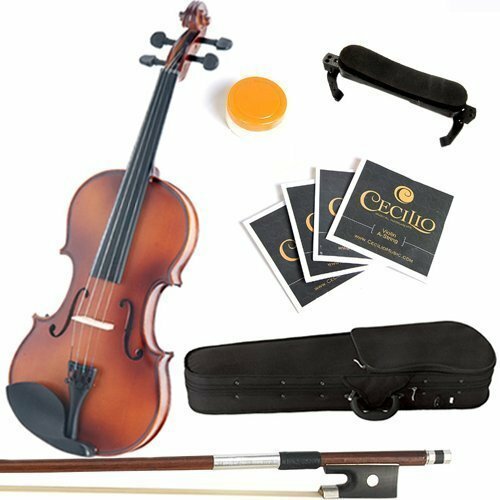 Cecilio CVN-300 is considered to be one of the best starter violins you can get. It delivers an amazing bang for the buck, with its solid wood construction, great build quality and a set of D'Addario Prelude strings. Another great kit option for beginners. This is also a kit and it comes with two bows, a case, one tuner and more. Beginners who want a solid starter that will last them for a good while should definitely check out the CVN-300. Bottom Line: Cecilio CVN-300 is the perfect starting point for any beginner. Simple as that. Following the success and popularity of the Cecilio we've just talked about, Mendini has also released a version of their own. This particular violin features solid spruce paired with maple back and sides. The two are in the same price range and are generally pretty close in performance. Mendini MV500+92D also comes with two bows, a tuner, and more. However, this kit includes a set of replacement strings. The tone is fairly bright but ultimately malleable. Bottom Line: ​Mendini's MV500 violin is a solid choice that offers a good foundation for any beginner. 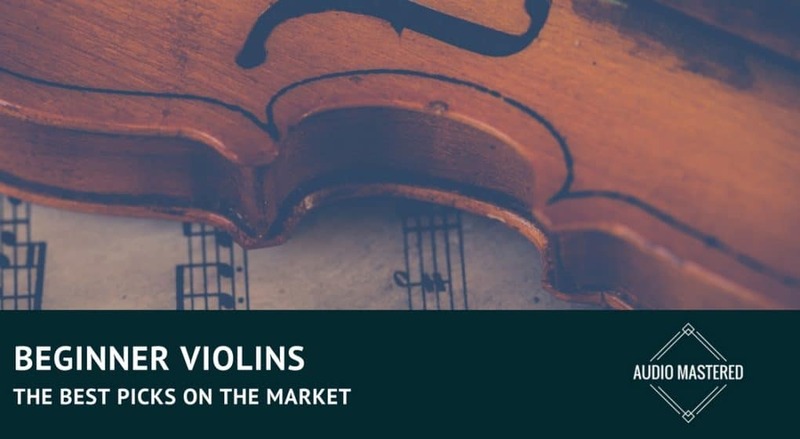 Moving one market segment up, we find the ultimate gold standard of beginner violins. We are of course talking about the Bunnel Pupil Violin by Kennedy Violins. This is a full sized, solid wood violin that simply features the best performance in this category. A mid-range option for those what are looking for better quality. It has been tried and tested many times by now and it still holds the title of the best learner models on the market. 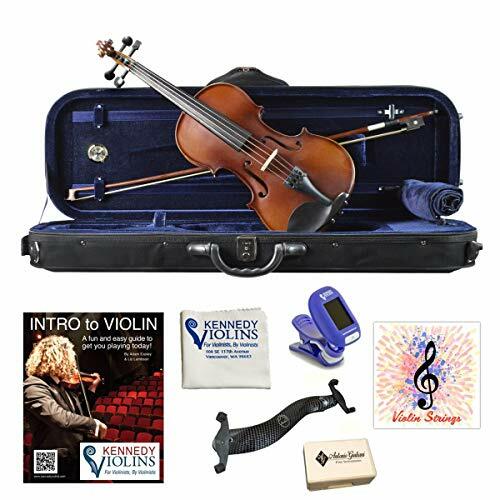 The violin comes with a case, a quality bow, D'Addario Prelude strings and more. Best of all, each one of these is checked and setup by Kennedy's luthiers before it's shipped out. Bottom Line: If you don't want to do any research and just want a good performer, this Kennedy model is definitely it. At this point you are probably wondering why we are mentioning the what appears to be the same violin as the last one on our list? Well, it's not. The choice for those looking for 1/2 size violin. This is a 1/2 model which is designed for younger students and those who are having a hard time using a full sized Bunnel Pupil. You are getting the very same build quality, same tone quality as well as accessories. Bottom Line: Even though 1/2 beginner violins are not all that rare, this Kennedy still manages to stand out from the rest. Moving up the Bunnel range, we see a Premier 4/4. Compared to the previous two Kennedy violins, this one is a bit more refined. You are looking at a solid wood, hand carved model that comes with lifetime warranty. The humble kit also includes a hard case a bow and a few other essential features. In terms of sound, build quality and overall performance, Bunnel Premier is hard to beat for the money. 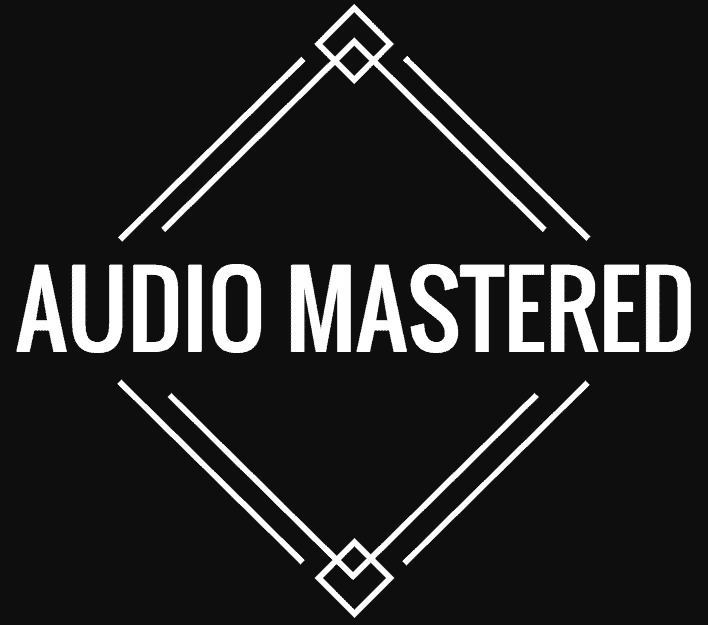 For those who are looking for a refined sound. This violin is meant to deliver a high standard at a reasonable price. If you ask us, that's exactly what it does. Bottom Line: ​Kennedy Bunnel Premier follows the impressive value for the money ideology we've grown to love. The next violin on our list represents the very top of its class. Fiddlerman is a great brand that is known for delivering performance and quality to its users. Their Artist series 1/2 violin has taken over its segment as the top performer in a very short amount of time. It features hand carved and hand assembled solid spruce top, maple back and sides as well as a French Aubert bridge. For those looking for the best quality with no limits on budget. The build quality and finish of this particular violin are just impressive. Same goes for the Carbon fiber bow that's included in the kit. Bottom Line: If you the budget, this particular Fiddlerman is an awesome choice. 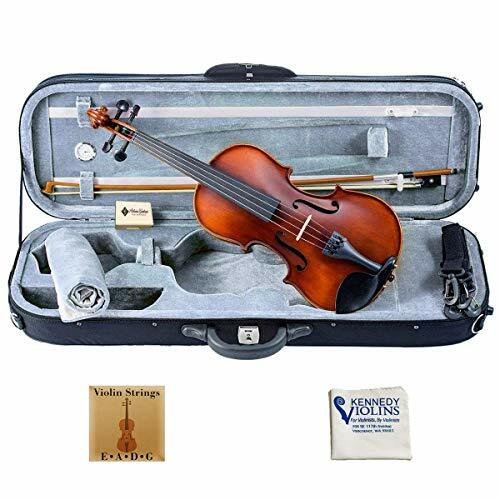 Louis Carpini G2 by Kennedy Violins is about as far as you can stretch beginner models. It features that same build quality and finish we are used to seeing from Kennedy, only on a more refined level. The materials used are solid spruce for the top and maple for back and sides. Pretty standard overall. 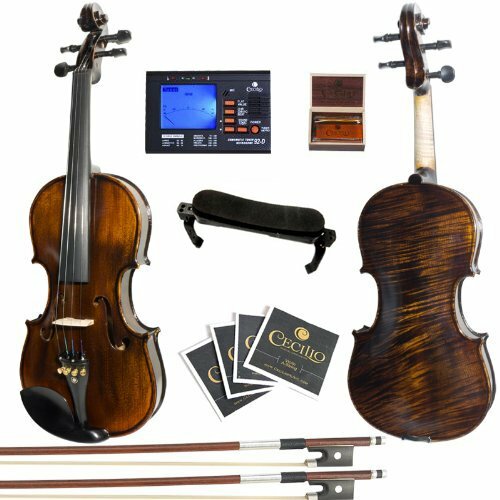 However, the tone this violin offers is anything but standard Louis Carpini G2 pushes the boundaries of entry level violins and blurs the line of separation from the mid range. Another premium option. Buy if you trust the Kennedy quality control. On top of that, it comes with a full starter kit of accessories and materials. Bottom Line: Kennedy Louis Carpini G2 is a good choice for those who don't want to buy violins every couple of years. Last but not least we have the absolute elite starter violin. Model 220 by D Z Strad is known to be the violin of choice for many of the worlds leading violin teachers. You are looking at an aged maple wood instrument which has been fined tuned from the moment it started taking shape. The tone is warm, clear and very refined. The violin comes with a case, a Brazil wood bow, rosin and more. Top choice for violin teachers. 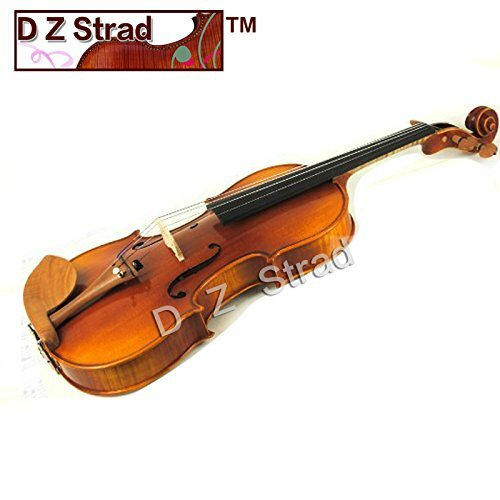 While it's not a perfect choice for everyone, D Z Strad Model 220 is at the cutting edge of its class. Bottom Line: While it's not a perfect choice for everyone, D Z Strad Model 220 is at the cutting edge of its class. This outfit includes a case, a brazil wood bow, shoulder rest, and rosin. That concludes our guide on best beginner violins. As we have seen today, there are plenty of models to go for and plenty of factors to count in when making your decision. At the end of the day, it is important to just get started. Everything else will fall into place.